10% of all your online purchases will be donated to the wonderful Royal Hospital for Women Foundation. Floreat Flower of the Month - Pink Bouvardia! Happy Friday everyone! And welcome to the Floreat Flower of the Month - Pink Bouvardia! Pink Bouvardia, is gorgeous, that's all I can say - I love it! It is a pretty, feminine flower, it smells nice, and it lasts for ages! Bouvardia symbolises enthusiam, so is a good flower to give someone who is working hard towards a goal. 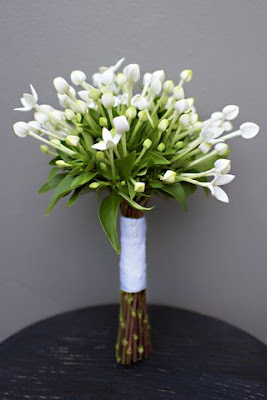 Bouvardia is also very pretty in white - some of you will know I use it a lot in weddings!!! This bouquet was a simple bouquet of white bouvardia - a very pretty, simple summer/autumn alternative to lily of the valley! Enjoy everyone, and go out and buy yourself a bunch this weekend! If you’d like to leave a message on the card please write it here. Also let us know if you have any special instructions for delivery.